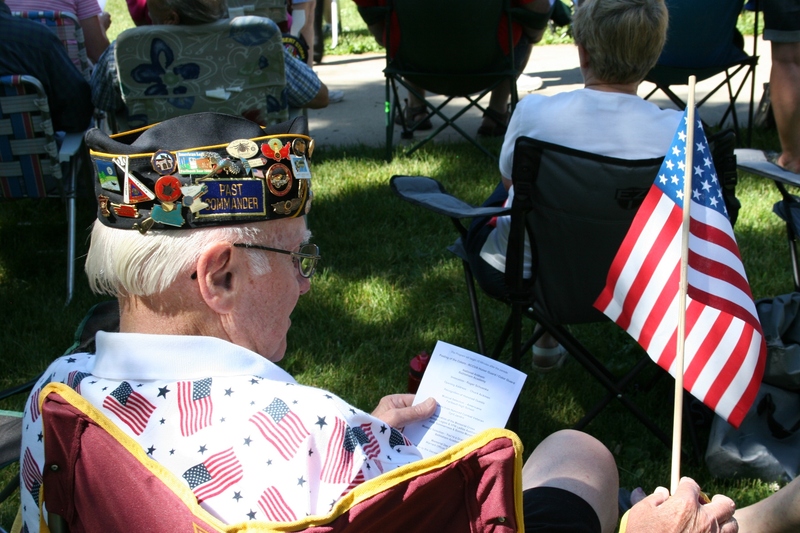 Korean War veteran Ray Sanders reviews a Memorial Day flier prior to a ceremony in Faribault's Central Park. I NEVER EXPECT TO CRY. But nearly every Memorial Day, I do. 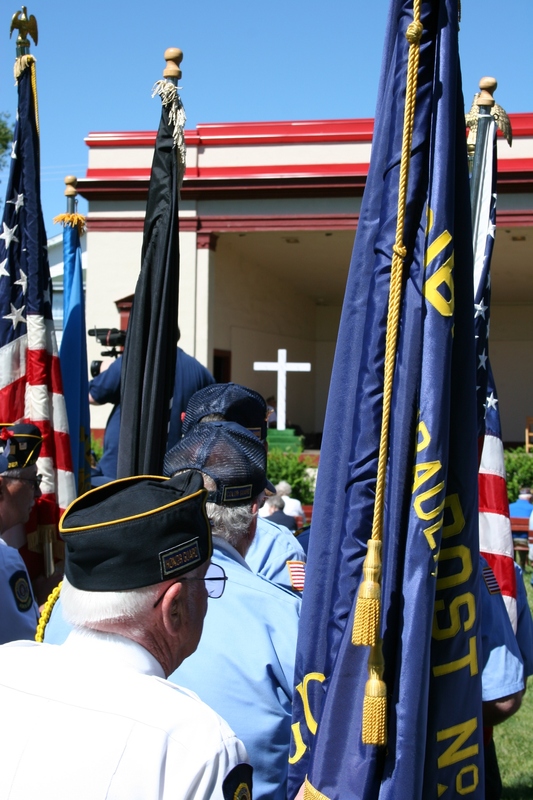 Today tears edge the corners of my eyes as a Korean Conflict memorial wreath is placed upon a white cross during a program in Faribault’s Central Park. Up until that moment, I am OK. But then, just like that, the emotions surface. I fight to hold back the tears. My lips quiver. I am thinking of my dad, Elvern Kletscher, who served on the front lines during the Korean War. If he was still here, I would thank him. But now, of my soldier-father, I have only his military photos to peruse, his few shared war stories to remember, his letters to read and his grave to visit. 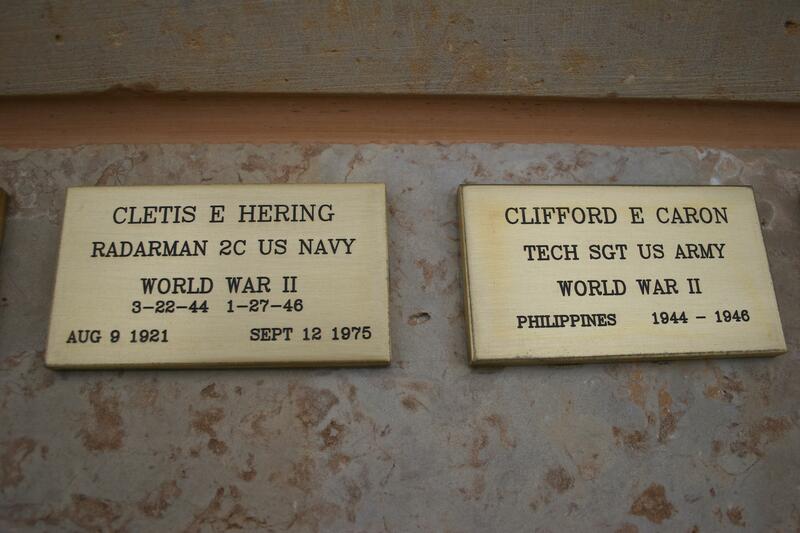 He has been gone seven years now although, truly, I lost my dad decades before that to the ravages of war. Today, please take time to remember and honor veterans, those men and women who served our country to preserve the freedoms we enjoy. 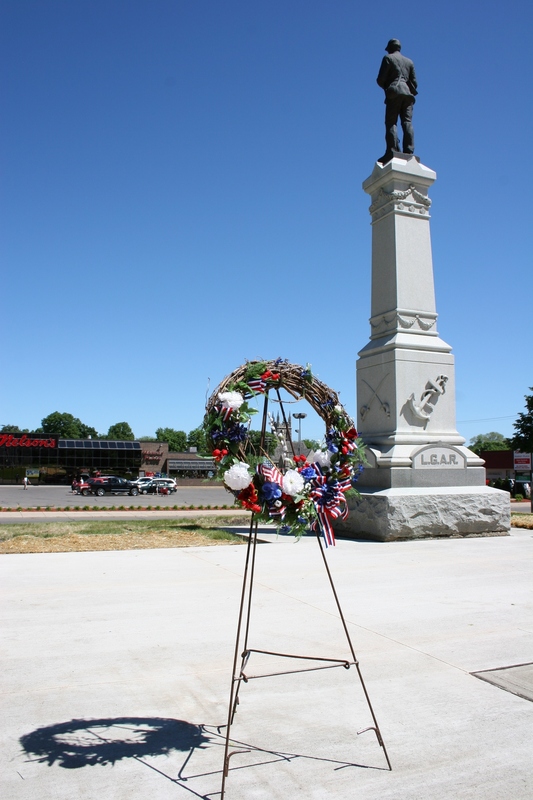 The Rice County Veterans Association Honor Guard/Color Guard awaits the start of a Memorial Day program, where memorial wreaths will later be placed upon the white cross seen here in the center of this photo. 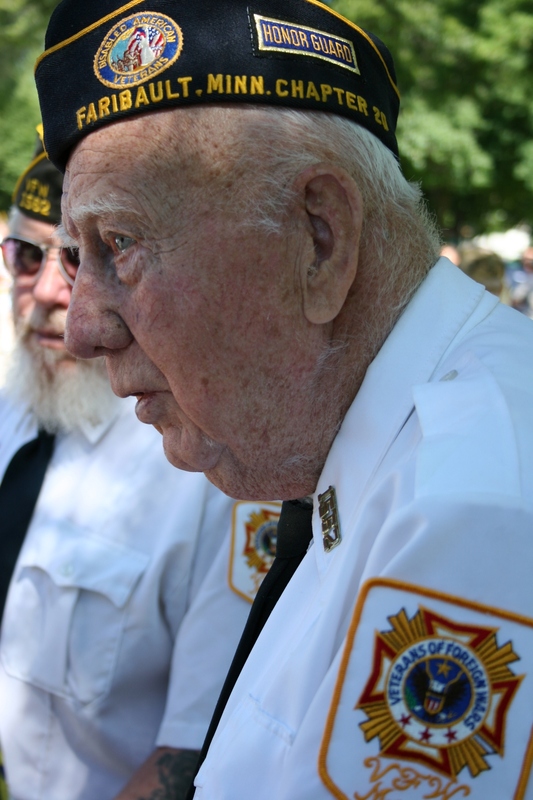 An aging veteran, among those we honor this Memorial Day. 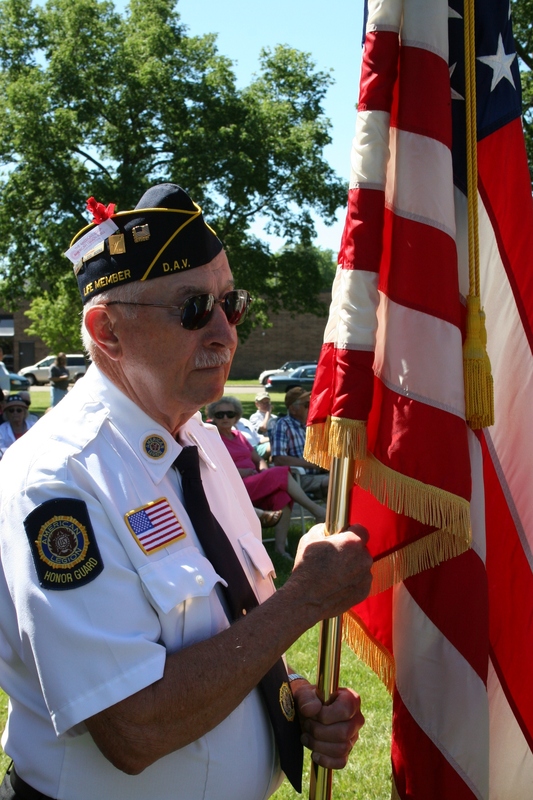 A veteran proudly holds the American flag, representing the country he served, the freedom he preserved. 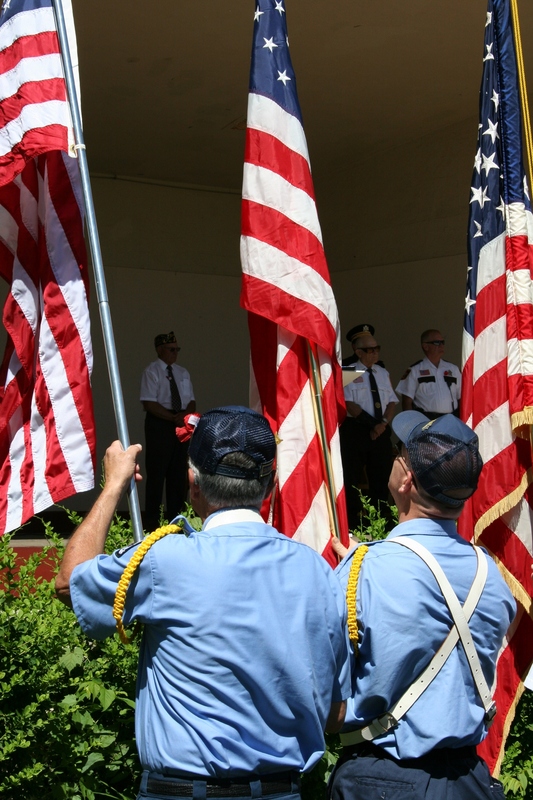 The color guard places American flags in front of the bandshell in Faribault's Central Park. 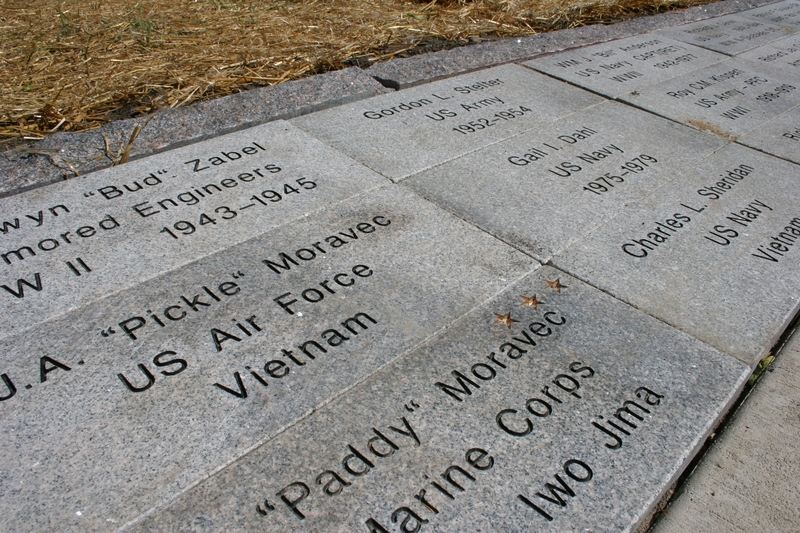 Just-placed pavers honoring veterans at the Rice County Veterans' Memorial in Faribault, currently under construction at the county courthouse. 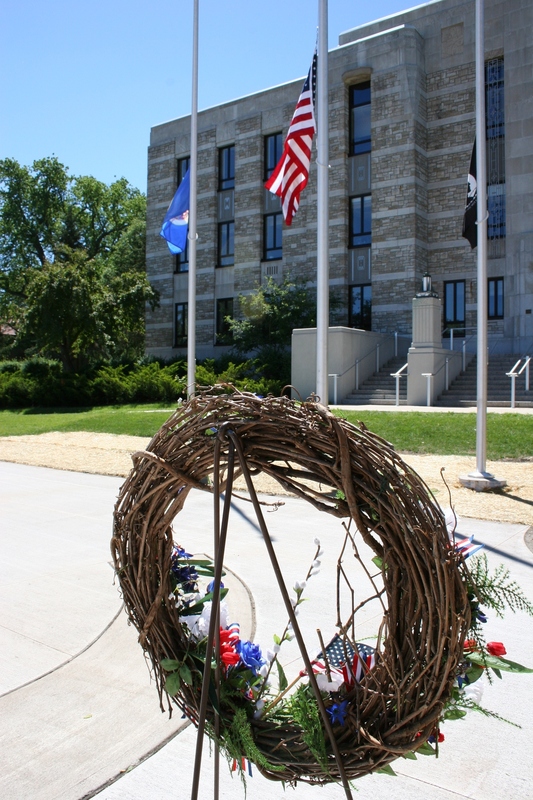 A wreath rests on the plaza of the Rice County Veterans' Memorial which is expanding from the Civil War Monument which has long graced the courthouse grounds. Flags fly at half-staff at the Rice County courthouse. Scroll to my story, Faith and Hope in a Land of Heartbreak. This shares the heart-wrenching experiences of my soldier-father and is my tribute to him. This was published in 2005 by Harvest House Publishers, two years after his death. IF YOU HOSTED a party and offered five types of pop and bottled water to your guests on an 89-degree day, which would be the top pick? What if you threw beer and wine into the mix? A non-government researcher, in an unscientific study conducted Saturday in Faribault, Minnesota, discovered what the general public, or at least the beer-drinking public, has long known. On a hot day, nothing quite quenches thirst like an icy cold beer. Now scientists have evidence to back up that long-held theory. The unidentified civilian researcher reported that he sorted and counted all of the empty beer and soda cans and plastic water bottles following a college graduation party at his home Saturday. “I didn’t think they (party guests) drank that much beer,” he states in an unofficial report released today by the consumer watchdog group Beverage Counters of America, tasked with analyzing beverage consumption in the Midwest. The researcher stresses that party attendees were drinking responsibly and had designated drivers. Because the study was limited to three selected beers—Grain Belt, Michelob Golden Draft and Michelob Golden Draft Light—BCA officials warn the results are inconclusive and cannot be applied to the general population. Beer drinkers at the Faribault research party consumed 14 cans of Michelob Golden Draft Light, the BCA report states. But a source, speaking on condition of anonymity, reveals that those numbers are likely tainted. Party-goers apparently smuggled their favorite brands, including two cans of Michelob Light, into the unsecured pilot test site in an attempt to skew results. Four empty cans of Coors Light, known to be the beer of choice for at least one guest, were also discovered during the can count. Grain Belt, long a Minnesota-brewed favorite, ranked second among beer drinkers with 12 cans of the beer consumed at the Faribault test site. Eight cans of Michelob Golden Draft were also consumed, although researchers are apparently questioning the validity of those findings. An unauthorized woman assisting with the research says she discovered an empty Michelob Draft can tossed into a bird bath and another thrown into a bed of ferns at the test site. The BCA speculates this may have been a covert attempt to sabotage the results. Consumers at the test site chose from these non-alcoholic beverages. IN REVIEWING POP CONSUMPTION, the researcher found Fresca to be the top soda selected by party guests 10 times. They were also offered Ruby Red Squirt, Mug root beer, Dr. Pepper and Coke. 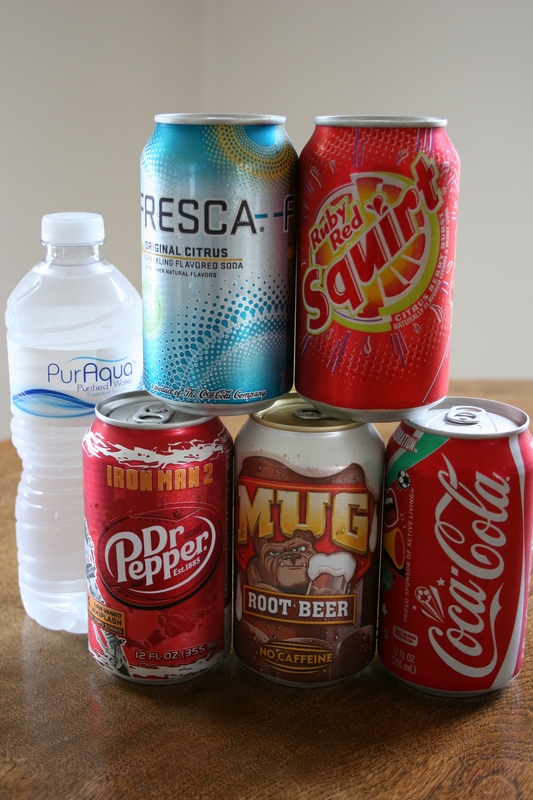 Total can counts showed that nine cans each of Squirt and root beer were drunk and four cans each of Dr. Pepper and Coke. Research specialists evaluating the soda can count data say they are focusing now on whether can colors impacted selection. They note that three of the cans are red, but that the top choice, Fresca, is packaged in a blue-green can. Scientists hypothesize that the brain may be predisposed to selecting a cool color during hot weather like that experienced Saturday at the Minnesota test site. The BCA report concludes that bottled water consumption in the pilot project equaled that of Fresca with 10 empty water bottles counted. There were no empty wine bottles. After receiving funding through the government program Cash for Beer Cans, the BCA now moves into the next phase of its research—expanding its test area and uncovering why icy cold beer is more thirst-quenching than pop on a hot day. MY FRIEND MIKE has an apple orchard. It’s not an active orchard, meaning he doesn’t market his apples. He shares them with family and friends. The orchard came with the house he bought in the country some years back. On a recent spring night after I arrive at Mike’s house for bible study, he gives me a tour of his yard. He’s a former floral designer/business owner and we share an interest in flowers and plants. As is typical, I have my camera with me. As we walk, I notice that the sinking sun has cast a certain surreal softness upon the land. The lighting in the orchard is perfect. 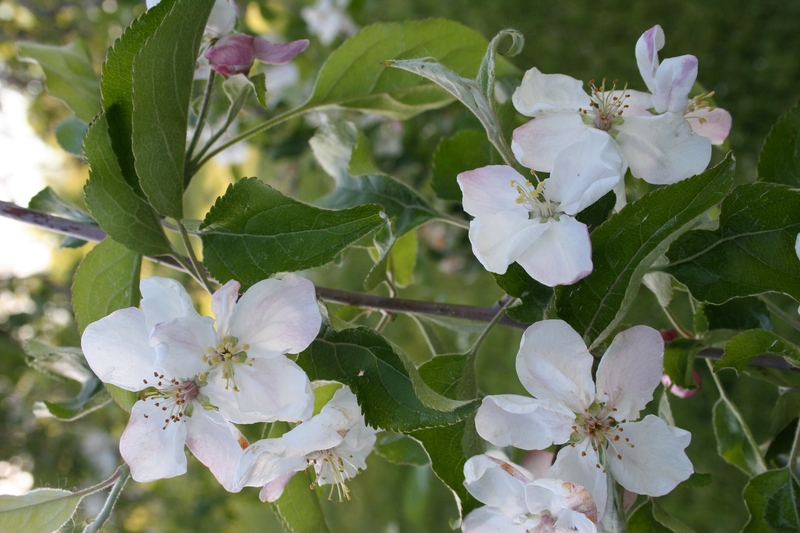 So I snap this photo of apple blossoms that will grow into apples, which Mike will pick, then peel and slice into a pan and cover with a crunchy rolled oats topping hinting of cinnamon. And then my friend will place a square of apple crisp upon a plate, add a scoop of vanilla ice cream and hand the treat to me. Then I will remember this beautiful spring evening when apple blossoms held the promise of harvest, and of apple crisp. Apple blossoms on an evening in May. WERE YOU SURPRISED THAT Lee Dwyze, and not Crystal Bowersox, won American Idol last night? If you don’t care, raise your hand. I’ll admit that I am a fan of this show, although not a faithful fan. I’ve strayed the past two weeks and missed the last singing competitions. But Wednesday night, with my ironing board set up in front of the television, I watched while I ironed vintage tablecloths for a party I’m hosting this weekend. This multi-tasking redeemed me from the guilt I felt for wasting two hours of a beautiful spring evening indoors and for not helping my husband clean the garage. In retrospect, I could have tuned in for the first 15 minutes or so of the show and the final five and not missed much. I would have heard the Idol contestants, and Alice Cooper, belt out School’s Out, one of those oldie songs that I’ve always loved. I thought Cooper looked a bit freakish, though, with his teased hair, heavy eye make-up and tight leather pants. There’s something about an old rocker dressing like he’s 20 that seems simply ridiculous. If I had turned off the television following that performance and then tuned in at around 9 p.m., I would have seen everything that really interested me. Much of the two-hour time slot was filled with tributes to judge Simon Cowell, who is leaving the show. The tributes were pure overkill given the focus should have been on final contestants Dwyze and Bowersox. That brings me to those two and to the final five minutes. Did the right singer win? Up until yesterday, and in recent weeks, I figured Dwyze would grab the title. And then, just before Ryan Seacrest announced the winner, I said, “It’ll be Crystal.” I, of course, was wrong. My husband, who had just finished cleaning the garage that I should have been helping him clean, wasn’t surprised. “It’s mostly women who vote,” he said. So there you go, if you care. 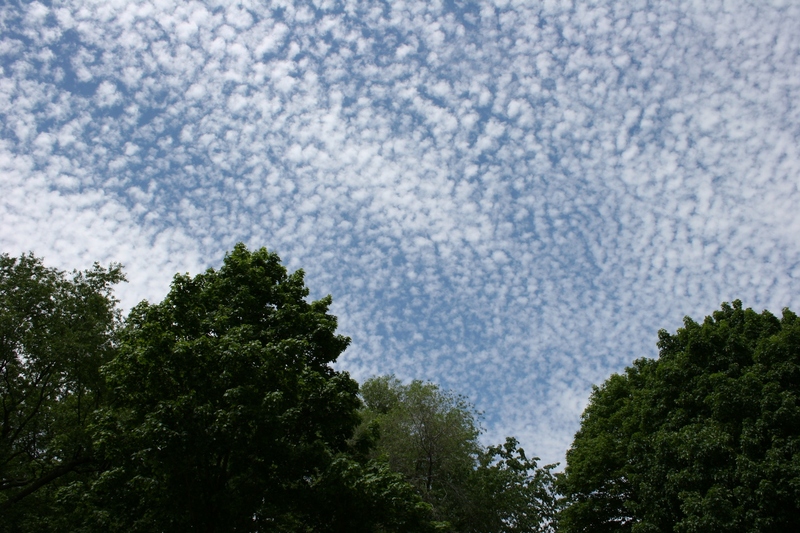 If I was a meteorologist, I could identify these cotton ball masses of clouds that hung over my Faribault home for a short time early Tuesday afternoon, another steamy day in Minnesota. Can anyone identify these? UNSEASONABLY WARM. Record-breaking temperatures. High humidity. You knew this blog post had to be coming. If I failed to write about the hot, summer-like weather we’ve experienced in southern Minnesota the past few days, I would risk deportation to Iowa or Wisconsin. Not that I have anything against those neighboring states, but I am a Minnesotan through and through. And as such, writing or talking about the weather is a given. To do so is a geographical right. Minnesotans boast/whine/complain/brag (choose your verb) about the weather. In the winter, we talk about the sub-zero temperatures, windchills, blowing snow, winter storm warnings, blizzard warnings and, oh, yes, school closings. In the summer we complain about the heat index and the humidity, always the humidity. In the fall, we worry about an early frost and about too much rain keeping farmers out of fields. But in the spring, typically, we are more content, unless, of course, the snow lingers too long, the weather is cool and wet or the farmers can’t get in the fields or there’s a late frost or there’s not enough rain. Let me restate that. Even in spring we live in a season of weather-induced discontent, although we should feel content after six months of winter. This spring, or at least in recent days, we’ve dealt with record-breaking temperatures. Here in Faribault on Monday, the temp soared to 95 degrees, unheard of for May 24. In my neighborhood, kids are plunging into wading pools usually reserved for searing summer afternoons. In my house, just days after our new central air conditioner was readied for use, I clicked the air switch to “on.” The cooling unit ran from Sunday evening to Tuesday evening, when a front brought much-needed rain and cooler temps. Last year we didn’t even install our window air conditioner. So this is Minnesota. Cool one summer. Hot one spring. In true Minnesota fashion, I will tell you, it could be worse. 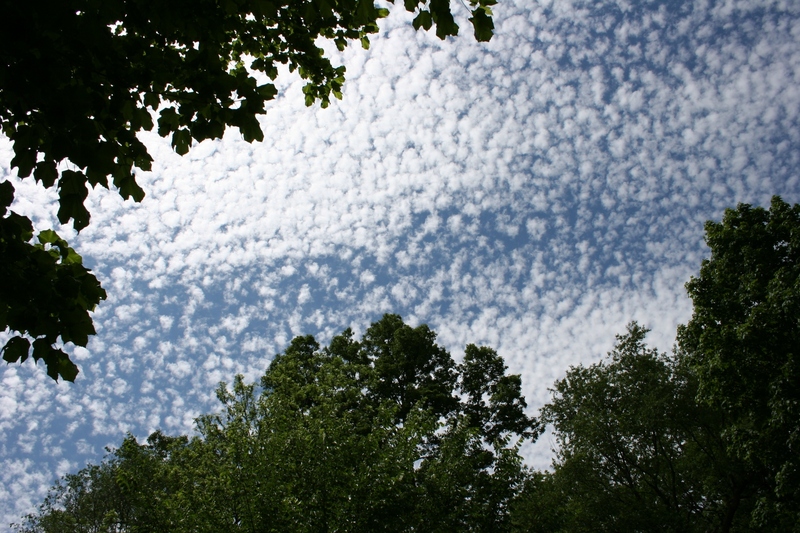 Oh, sky, lovely sky. These clouds captivated me with their unique beauty. 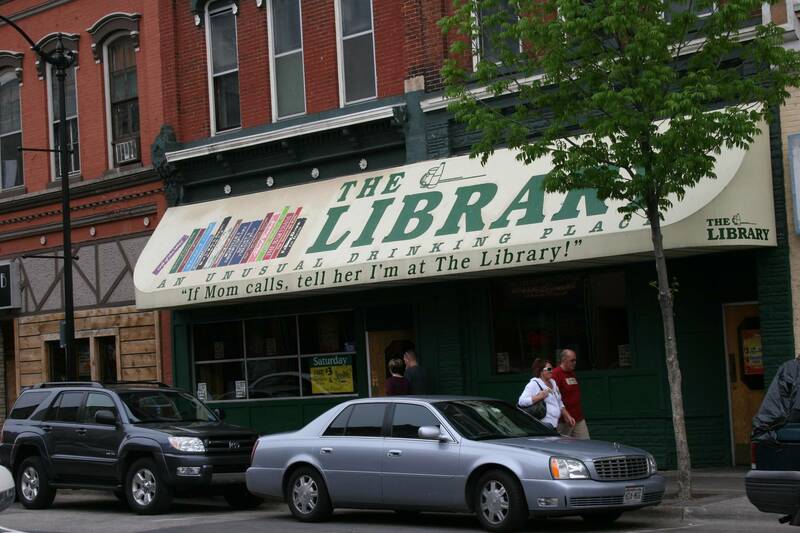 The Library, among many bars frequented by college students in downtown La Crosse, Wisc. WHEN I SPOTTED A UNIQUE STATEMENT on a downtown La Crosse, Wisc., bar recently, I considered the slogan creative genius. I haven’t changed my opinion. The“If Mom calls, tell her I’m at The Library!” excuse is sure to appeal to the college-age crowd that frequents the bars along Third Street South just blocks from the Mississippi River. I mean, who can lie to their mom? Study the book spines on the decorative awning and you’ll find Call of the Wild, Webster’s Drinktionary, Our Two-Party System (and they’re not talking politics), Wildlife of North America, The Boston Ale Party, The Power of Positive Drinking and more. Clearly, this bar targets college students. Why wouldn’t they? If La Crosse didn’t have so many alcohol-related river drownings, I probably would maintain my light-hearted attitude toward partying in this town. I have no issues with responsible bars or with responsible drinking. But it’s tough to ignore that since 1997, nine young white males have drowned here in the Mississippi, most of them after a night of too much imbibing. Those men were on my mind when I walked through Riverside Park in La Crosse. I wish they hadn’t been, but they were. As I admired sculptures, watched boats zip by, talked to an old man fishing for walleye, peered over the river wall at six fledgling ducklings in the dark, murky waters far below, I couldn’t push from my thoughts that this river has become a watery grave for too many. 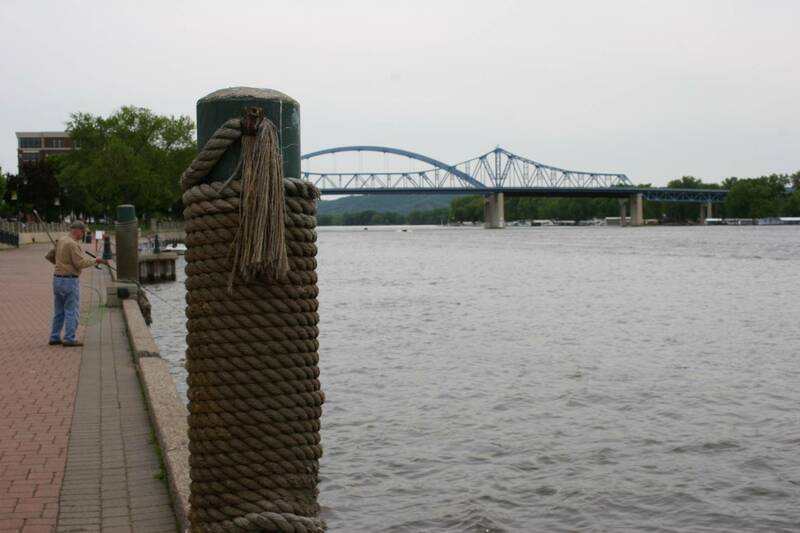 The River Walk in Riverside Park along the Mississippi River in La Crosse, the site of numerous drownings. 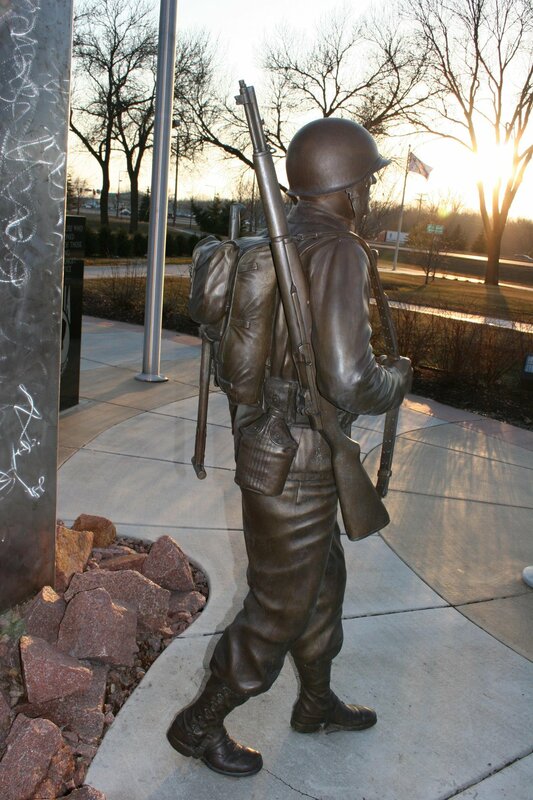 A soldier statue at the Northfield Area Veterans Memorial at Riverside Lions Park in Northfield. TEARS STREAMED DOWN the old soldier’s face as he read a letter of thanks. The writer could not know how much the note of appreciation meant to this veteran. But Bob and Louise know. On Saturday the Nerstrand couple accompanied a plane-load of Minnesota WW II veterans on a one-day Honor Flight to Washington, D.C., to visit the WW II and other war memorials. The pair paid for their flight and that of several veterans and served as guardians for two soldiers. It’s a trip they’ll always remember, particularly “mail call” aboard the flight. As the names of soldiers were read and thank you letters distributed, the tears began to flow. For one veteran, the moment was especially poignant. Bob shares the man’s story. The soldier, he says, never got, or even expected, a letter while serving in the military. He was an orphan. So Saturday’s mail call deeply touched him, brought the old soldier, and Bob and Louise, to tears. Many tears fell during that Honor Flight, they say. Bob spoke of the crowds and patriotic escorts, the appreciative signs and personal words of thanks to the soldiers when they arrived in the nation’s Capitol and returned later that evening to Minnesota. Louise tells of visiting Nerstrand Elementary School to talk about the Honor Flight. The students penned letters of thanks like those received by the orphan soldier. As Bob and Louise speak of the Honor Flight, goosebumps rise on my arms. I think of my father who fought on the front lines during the Korean Conflict. He was not welcomed home. In some small way, through the words my dad left unspoken, through his years of struggle, I understand the importance of paying respect to WW II soldiers today, decades after they’ve served their country. I am grateful to Honor Flight organizers and to folks like Bob and Louise who sponsor and accompany these veterans. And I am grateful to the letter writers, for their words have the power to mend a soldier’s heart. 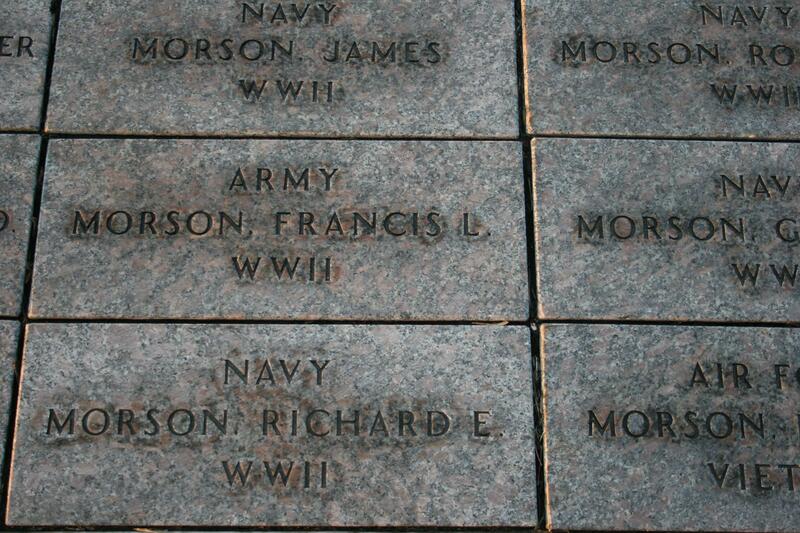 Soldiers' names engraved in pavers at Northfield Area Veterans Memorial Park. WW II soldiers honored at a veterans' memorial along Minnesota Highway 21 in Shieldsville.